David Walker was born in Wilmington, North Carolina in 1796. He was the son of a free black woman and his father was a slave. Since his mother was free, he was also free because by law he inherited her legal status. Little is known about the first two decades of his life, but from fragmentary records, it is believed that he was an active member of the African Methodist Episcopal Church (AME), and that he traveled throughout the coastal regions of the Upper South staying in towns such as Charleston, South Carolina, a major port with a significant free black population. In his travels, Walker learned much about the inequities of American slavery, and the potential of religious evangelicalism to motivate and inspire African-Americans throughout the United States. In 1825, Walker settled in Boston, Massachusetts and within a few years he married Eliza Butler, the daughter of locally prominent free black family. Walker also joined the African Lodge, the local branch of the African Methodist Episcopal Church administered by the Reverend Samuel Snowden, a strong anti-slavery advocate. He also became a member of the Massachusetts General Colored Association, an organization that, more than any others, assertively promoted the abolition of slavery. This community helped solidify Walker's strongly held views that slavery could not be tolerated and that African Americans must take an aggressive role in resisting the institution. 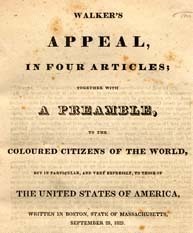 In 1829, Walker wrote and published Appeal to the Coloured Citizens of the World, a document that argued for racial equality and exhorted African Americans to resort to violence if necessary in resisting slavery. Notable for its radicalism, the Appeal was written in a manner that suggested Walker intended it to be read aloud as an emotional sermon or speech to groups. In fact, copies of it were located in a number of seaports throughout the South, giving credence to the idea that Walker had hoped it would reach enslaved and free African Americans throughout the country. Shortly after its publication, Walker died of tuberculosis. Some believe his Appeal was the inspiration for a number of slave escapes and insurrections. Furthermore, the document was a harbinger of the incendiary abolitionist rhetoric that would soon stir political and sectional conflict throughout the United States.